Created roughly 4,000-5,000 years ago in China, the earliest versions of something like chopsticks were used for cooking (they're perfect for reaching into pots full of hot water or oil) and were most likely made from twigs. While it's difficult to nail down a firm date, it would seem it wasn't until around 500-400 AD that they began being used as table utensils. One factor that contributed to this switch was a population boom across the country. Consequently, resources, particularly for cooking, became incredibly scarce. As a result, people began cutting their food into tiny pieces so it would cook faster. The bite sized morsels rendered table knives obsolete, as there was very little left to cut. However, they were now perfect for eating with chopsticks, which were also made from cheap materials and easily made. Thus, a trend was born. The honourable and upright man keeps well away from both the slaughterhouse and the kitchen. And he allows no knives on his table. It was due to this that it's believed that Chinese chopsticks are traditionally blunt at the tip and thus somewhat poor choices to try to spear food as you would with a fork. Within about a century of this, chopsticks had migrated to other Asian countries, such as Japan, Korea and Vietnam. 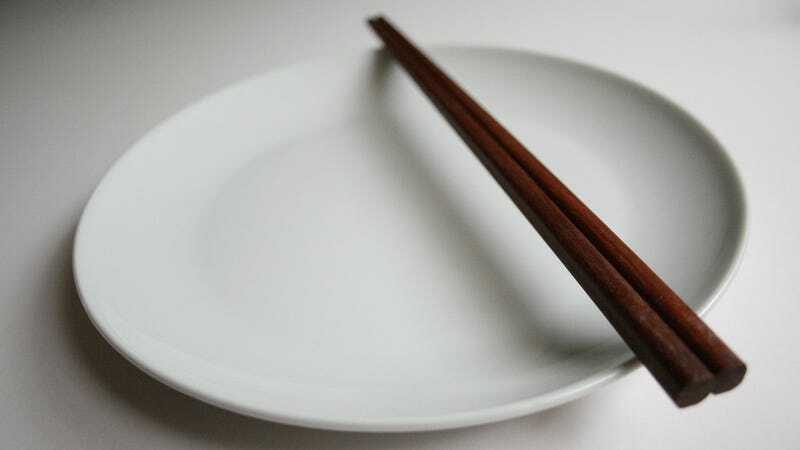 One distinct difference between Japanese and Chinese chopsticks was that the former were made from a single piece of bamboo that were joined at the base. In addition, Japanese chopsticks were originally used solely for religious ceremonies. Regardless of their differences, chopsticks remained popular in both countries and are still the primary utensil of choice. While the early chopsticks were more often than not made of some cheap material, such as bamboo, later silver chopsticks were sometimes used during Chinese dynastic times in order to prevent food poisoning. How? It was believed that silver utensils would turn black if they came into contact with any life threatening toxins. Unfortunately for those engaging in this practise, silver doesn't turn black when it touches the likes of cyanide or arsenic, among other poisons. However, it most definitely can change colour if touched by garlic, onion or rotten eggs – all of which release hydrogen sulfide which reacts with the silver causing it to change colour. For anyone that has ever had difficulty eating rice with chopsticks, you may have wondered why anyone would choose this particular utensil for consuming such food with. Perhaps one of the earliest of table utensils, such as the spoon, would work better here. But you see, in Asia, the majority of rice is either a short or medium grain variety often with starches that are particularly gummy or clumpy. As such, it sticks together and is quite easily picked up by chopsticks. In comparison, many Westerners eat long grain rice (often highly processed) with is much fluffier and the individual grains are more distinct and for the unpracticed hand, difficult to eat with chopsticks. Was There Really a General Tso? Ancient spoons in China also sometimes featured a pointy end to be used as a one prong fork / knife… perhaps the first known instance of the spork or spnife, depending on how you want to look at it. The ruins of Yin provide both the earliest examples of Chinese writing as well as the first known chopsticks. They were a bronze set that were found in one of the tombs at the site. Traditionally, Chinese chopsticks are made from wood or bamboo that's unfinished. In comparison, Japanese chopsticks are traditionally finished. Spear your food with your chopsticks. Dig around in your food for a particular item. This is referred to as "digging your grave" and is considered extremely rude. Tap your chopsticks on the edge of your bowl. This is what beggars do to attract attention. Children to hold their chopsticks incorrectly, as this will reflect poorly on the parents. Cross your chopsticks on the table. Stick your chopsticks vertically in rice, as this is a practise reserved for funerals. Transfer food from your chopsticks to another persons. Bite on your chopsticks or to let them linger in your mouth for too long. Use your chopsticks to pick up contents from a soup bowl. Place your chopsticks on the table. You should either use a chopstick rest or place them across the top of your bowl. Pick up your utensils before your elders. Brings your bowl closer to your mouth to eat. Use chopsticks to eat rice unless you're someone considered lower class. Spoons should be used instead. Place you chopsticks in the shape of a V once you've finished eating. This is considered to be a bad omen. Pick up food directly from the table and eat it. The item should be placed in your own bowl first. Place your chopsticks in your mouth whilst choosing food.